If you think “fusion” is a recent culinary development, think again. Yoshoku is a branch of Japanese cuisine with western origins. The Occidental influence came to Japan in the mid 19th century, when Japan began to shun previous isolationist policies. The Meiji Constitution of 1890 (rewritten in 1947) was an exercise in fusing European governance with Japan’s feudal system, and in the same vein, Japanese chefs borrowed western cooking methods and turned them distinctly Japanese. There are specialist Yoshoku restaurants in Japan, like the famous Mikawaya in Ginza, Tokyo known for its rarefied atmosphere, white tablecloths, polished silverware and upstanding waiters in waistcoats. These restaurants serve a range of Yoshoku dishes like Hayashi Rice (rich, sweet demiglace sauce on beef) or Ebifurai and Kakifurai (crumbed prawns or oysters served with tartare sauce and requisite shredded cabbage), Omuraisu (thin omelette wrapped around stir fried rice with tomato sauce, a kiddies’ favourite) and Hambagu Steak (beef burger minus the bun, covered with a rich sauce). There are also Gratin dishes like scallop or chicken gratin. And of course, there’s the Kareiraisu (curry made gluggy with roux) which is a strange concoction that’s part Indian, part French and all Japanese. There’s another Japanese curry called Doraikarei which is dry (dorai) and is spicy mince meat topped with finely shredded potato chips, scrambled egg and red pickled ginger…interesting, and Kei makes a fabulous version. But you don’t have to go to a Yoshoku restaurant to have such dishes, as they tend to appear on many menus, like Korokke (creamy chicken or crab croquettes) which are often found at izakaya and tonkatsu is one everyone loves. Yoshoku (a proper noun) might once have been fusion, but is no longer. It’s now wholly Japanese. If nothing else, the Japanese are great making uniquely Japanese things that aren’t, like tempura (borrowed from the Portuguese) or ramen and gyoza (from the Chinese, 20th century). 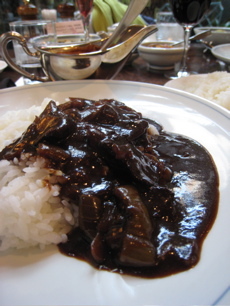 So Hayashi Rice for example, may have its roots in beef stew or demiglace sauce, but is now distinctly Japanese, for where else but in Japan can you find Hayashi Rice, or for that matter, Ebifurai, Omuraisu, Korokke? Fusion, on the other hand, can be found almost anywhere (like on Nobu or Tetsuya’s menus), and is essentially a new creation with mixed culinary roots-like salted kombu seaweed encrusted on salmon confit. A really good book of Yoshoku recipes is Jane Lawson’s Yoshoku from Murdoch Books. It has all the main dishes we like, and easy to follow recipes. Japanese Cuisine: Umami, the new culinary black?